People involved with hospital coding and billing finally have something to take their minds off the Medicare recovery audit contractors (RACs). In typical good news, bad news fashion, however, the flip side is there’s a new threat from Medicaid RACs. If your region’s RAC has been reasonable in its diagnosis related-group (DRG) changes and/or your facility maintains solid coding practices with a well-staffed RAC response team, you might not be overly concerned. After all, your coding is compliant, and appeals are either unnecessary or are being processed to your advantage. The Medicaid RACs are going to be modeled after the Medicare RACs, so things ought to continue going smoothly, right? Well, perhaps not. The Centers for Medicare & Medicaid Services (CMS) learned from the Medicare RAC demonstration period that an auditing agency must have qualified (ie, appropriately credentialed) coding, nursing and related clinical staff, and a physician medical director. Utilization review nurses know medical necessity criteria for inpatient status and for appropriate care. Coding professionals understand the strict and very nonclinical coding and sequencing rules for ICD-9-CM and CPT. A physician medical director’s determination is without substitute for the many clinical situations that are not delineated in a medical necessity decision tree, such as those provided by InterQual or Milliman. None of these three professions can substitute for another. All are mandatory in an audit for medical necessity and DRG accuracy if the findings are to be considered accurate and have not falsely penalized either the payer or the provider. This seems to be working reasonably well in the Medicare RAC project. But what does this have to do with the Medicaid version? Read the CMS’ final rule carefully. Each state’s RAC must have a medical director unless it requests and is granted an exception. Each state’s RAC must have qualified clinical personnel (ie, coders for code audits, nurses for clinical audits) unless it requests and is granted an exception. What about a fair appeals process? You guessed it: “Each State has indicated that it already has in place an administrative appeals infrastructure they will use for a provider to appeal an adverse Medicaid RAC determination,” the rule reads. How does your state handle its Medicaid coding and DRG audits? Despite the fact that the CMS approves the coding rules and Medicaid is part of the CMS, do your state’s Medicaid auditors ever disregard the ICD-9-CM criteria for inclusion of secondary diagnosis codes? Do they disallow those rules for DRG payments in favor of internal requirements based on severity of illness or intensity of service? Does a team of utilization review nurses ever remove valid secondary diagnoses from a significant percentage of short-stay obstetric and newborn cases every year, downcode the DRG, take back the difference in payment, and then report the cases to the Office of Inspector General and the CMS as “corrected overpayments”? • any implication for future healthcare needs (newborns only). • removing a code for mild preeclampsia that is clinically evaluated with labs, treated with appropriate medication, and monitored closely by the physician and nursing staff because the Medicaid auditor decides the condition was not severe enough to justify the payment associated with the code’s correct DRG. Why isn’t this fair? Coding rules for DRG assignment assign hospital pay from the CMS based on the average cost of taking care of common patient problems. If a mom’s delivery admission is expensive because of severe anemia or if the anemia is easily treated and she doesn’t stay long, the DRG pays the same in both cases. No matter if a newborn is terribly sick from severe hypoglycemia and stays in the hospital for two weeks or if the baby has mild hypoglycemia and only needs extra labs and early feeds, the DRG payment is the same. Hospitals are not allowed to ignore the coding rules on Medicare or Medicaid claims to receive a more favorable payment. The CMS would quickly declare the facility to be guilty of the dreaded F-word (fraud). What if the payer ignores the coding rules to change the payment in its favor? If this ever happens in Medicaid audits, how effective is your state’s “appeal process already in place”? When a provider appeals—with coding rules and physician documentation confirming the diagnosis and that it met CMS rules for affecting care on the encounter—are these types of DRG denials being overturned? Does your state’s current administrative appeals infrastructure include qualified, credentialed coders who review appeals? Are there any that participate on the original audit and denial team? Does it have any credentialed coders? Now are you worried about the impending Medicaid RAC program? If so—and if the current process is going to be cloned—will there be any hospitals left that can afford to continue treating the ballooning Medicaid patient population in today’s high-unemployment, low-income economy? It’s unlikely you’ll find a taxpayer willing to argue that payers should be able to audit for and recover overpayments, and that providers should have an effective and fair appeals process should they believe a payer has unjustly taken back its payment. However, they are likely to tell you that fair is fair: If hospitals and Medicare have to play by the CMS’ rules, then Medicaid should too. An individual hospital doesn’t have much hope in a David vs. Goliath argument with a state or federal agency. A group of hospitals or a state hospital association probably doesn’t have a very big rock to sling in the fight either. Get involved, speak up, and motivate your state hospital and local HIM associations to join the fray. Express your concerns to government and political representatives. After all, David didn’t win his historical battle by lying down. 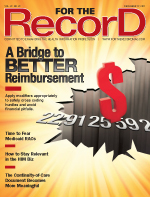 — Judy Sturgeon, CCS, CCDS, is a clinical coding/reimbursement compliance manager and a contributing editor at For The Record. While her initial education was in medical technology, she has been in hospital coding and compliance for more than 20 years. For more information on this issue, visit www.gpo.gov/fdsys/pkg/FR-2011-09-16/pdf/2011-23695.pdf, www.aha.org/advocacy-issues/rac/index.shtml, and www.medicaid-rac.com.